I was delighted to see that the Duchess of Cornwall turned up for the formal dinner at the 2013 Commonwealth Heads of Government Meeting (CHOGM) in Sri Lanka in full tiara gear - and looking fabulous to boot in the Greville Tiara along with a favorite pair of diamond earrings, a diamond bracelet, and the Queen's family order. When in attendance at the biennial meeting for the heads of government of the Commonwealth nations, the Queen turns the black tie dinner into a tiara event for herself. I wondered if the Duchess, who accompanied the Prince of Wales as he opened the summit in his mother's place, would continue the tradition - after all, it has become rare to see royals in tiaras on solo trips without the monarch. It's nice to see the event continue to receive a bit of added pomp, given how important the Commonwealth has been to the Queen over the years. 1997: On the Queen, the Grand Duchess Vladimir Tiara with pearls, Queen Victoria's Golden Jubilee Necklace, Queen Victoria's Pearl Drop Earrings. The Queen Mother's jewels include the Greville Tiara. 2003: A pearl and diamond set we haven't covered yet. This year she opted for a less formal look and did not wear a tiara. 2007: Girls of Great Britain and Ireland Tiara, Antique Girandole Earrings, Nizam of Hyderabad Necklace. The Prince of Wales and Duchess of Cornwall were also in attendance - Camilla made one of her most dazzling appearances to date in the Greville Tiara and the full five strands of the Greville Festoon Necklace (which can be worn as separate strands of two and three, as seen on the Queen Mother above). 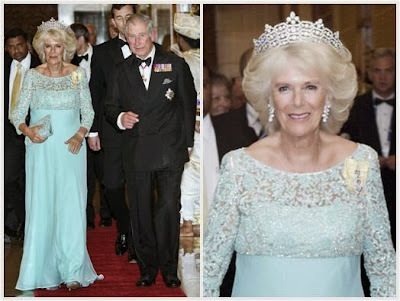 2013: The Duchess of Cornwall only, see top of post.